Story: I am sure you have heard the line - "It's not what you said.. it's how you said it".. Someone on a food show would have said - "The contrast in the texture of avocado and asparagus with the crisp freshness of the mint..blah blah blah.."
Here's the instant reaction from my father-in-law (in Marathi) - "Aahaaha.. ekdam maja ali salad khaun.. He asparagus mhnaje Shivajichya Ganimi Kavyasarakha.. madhech surprise detay." In English - "Oh... I really enjoyed eating this salad.. The asparagus is like Shivaji's Ganimi Kava.. a total surprise.."
P.S. : In case you are wondering.. Ganimi Kava is not a Japanese word.. It is actually a Marathi word that refers to guerrilla tactics that Chhatrapati Shivaji Maharaj pioneered. In colloquial Marathi this term is used to refer to the "surprise" element of the guerrilla techniques. 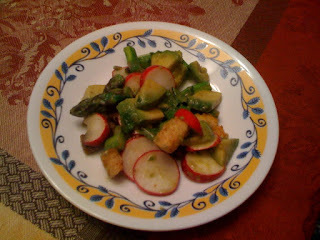 Cut the asparagus stems into 1 inch pieces. In a salad bowl mix all the ingredients. Adjust the amount of lemon juice and chat masala as per your taste. Lovely idea to mix red radish in the salad.